Undergraduate students will write a 700-750 word essay that demonstrates how they used information literacy instruction and/or library information resources to develop and complete an applied or basic science research project. Applied or basic science research projects are often assigned within biology, chemistry, physics, engineering, mathematics, and nursing courses. Students will discuss how they applied information literacy concepts and skills to the research process by answering the 5 questions listed below. 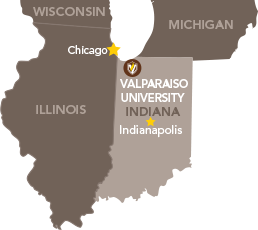 Be a current Valparaiso University undergraduate (in any class or discipline). Have completed the project for a credit course at Valparaiso University. Allow their work to be publicly displayed in the library and online. Individuals may write about a solo research project or a group research project in which, as a member of the group, they took an active role. Eligible projects include papers, slides, poster image, or any research project that resulted in a presentation. Describe the purpose of your project/paper. If appropriate, describe the process used to formulate your research question or PICOT question. What skills did you develop and use during your search for information or for your literature search? Discuss your methods for selecting sources. Explain how you evaluated the sources. If applicable, explain how you evaluated the level of evidence. Discuss your methods for making connections between sources and/or synthesizing the findings of various published studies, research findings, etc. What aspects of the information research process did you find most challenging? How did you overcome the challenges? Final research project (paper, slides, poster image, summary of presentation, etc.). Please do not include your name or class on the paper. Application deadline is 5:00p.m. on Friday March 22, 2019. Incomplete or late applications will not be considered. A committee consisting of faculty from the library and applied and basic science disciplines (biology, chemistry, physics, engineering, mathematics, nursing, etc.) will review the 700-750 word essay submissions using a standardized point-based rubric. Though students will be asked to submit their previously completed research project, these will not be part of the evaluation; committee members may choose to review the completed projects as helpful context for the essays. The student who receives the most points will receive the $1,000 award at the Valpo Scholarship and Creative Work Reception held during the spring semester.